If anyone wants to help fund our ad campaigns, you can use the PayPal buttons above, or you can email me directly: Alec Rawls at alec@rawls.org. If anyone would prefer to pay a newspaper directly for one of our ad buys, that can also be arranged. Tenth anniversary ad campaign: Tom Burnett Sr. and I are running a series of large color ads every day of the week leading up to the tenth anniversary of 9/11. Each ad is 2/3rds of a page in color on the back of the front section of the Somerset Daily American, below the weather map, so this is prime placement. The linked PDFs are to the actual ad copy. We also ran two advertisements in July, pressing the "Who broke the circle?" question: They call the design a broken circle now instead of a crescent, but the unbroken part of the circle, what symbolically remains standing in the wake of 9/11, is just the original Crescent of Embrace? 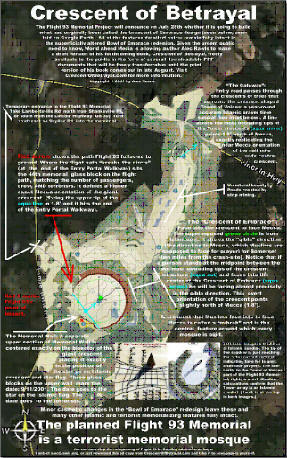 So who is being depicted by architect Paul Murdoch as breaking the circle of peace on 9/11? It can only be the terrorists, who are also depicted as leaving a giant Islamic shaped crescent in its place. Here is the full page full-color ad that Tom Burnett and I ran in the Somerset Daily American for the 9/11 anniversary weekend 2010 when the Laura Bush and Michelle Obama were both visiting. 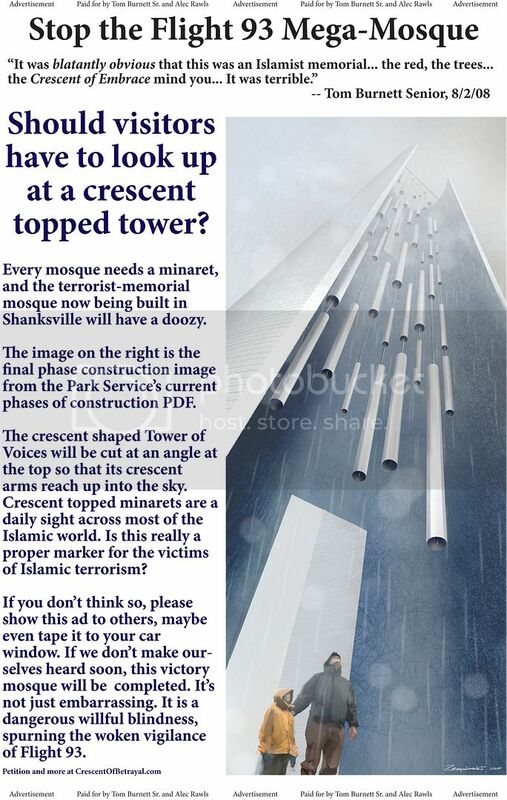 Stop the Flight 93 Mega-Mosque! Ad 1: "It was terrible"
Ad 2: "Should visitors have to look up at a crescent-topped tower"
If you would like to help fund future ads, just hit the tip jar, and THANKS! If you want to run an ad in your own local paper, email alec@rawls.org and I will put together an ad together to suit your purpose. Click on thumbnail for the full high resolution PDF (300dpi). Anyone can print this out and post it as a flyer around town or campus. The high resolution also allows it to be viewed in fine detail in on your computer screen. Half page full-color ad in the Somerset Daily American, 7/31/2008. Announces Tom Burnett's trip to Somerset to try to stop the crescent design. Also announces the schedule for our rally, and points out the obvious terrorist memorializing implications of Paul Murdoch's circle-breaking/ crescent-creating theme. Two color ads in the American Daily, 2-1-08, urge the people of Somerset to storm the next day's public meeting of the Memorial Project and tackle the hijacker! Below are PDFs of four foam-boards that Tom Burnett is taking to a Republican convention in Wisconsin at the end of April 2008. Each board illustrates one of the four objections that are highlighted in our petition for a Congressional investigation into the crescent design. Published in the Somerset Daily American 8/3/2007 (11.25 x 12, 300dpi, CMYK color). Ad tells the people of Somerset how the Memorial Project has managed to garner final approval to start building Murdoch's mosque, despite the fact that every Advisory Commission member is fully aware of the factual accuracy of my claim that a person facing into the giant central crescent is facing Mecca (something I learned from one of the Advisory Commission members at the meeting). Starts off with an important CORRECTION: the Johnstown Times Tribune DID publish reporter Kirk Swauger's verification of my Mecca-orientation claim. CORRECTION: The copy for the above ad has a crucial error in it. I leave it posted here for reference purposes only. DO NOT download and republish this ad! 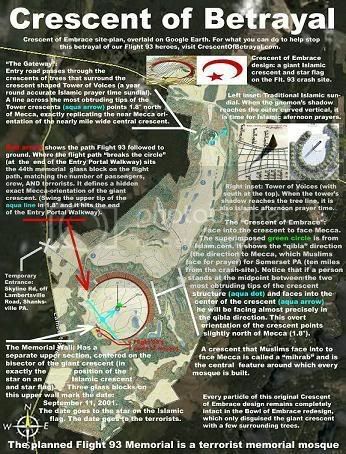 His claims seem to be backed up by coordinates for the direction of qibla from Somerset that can be found on Islam.com. 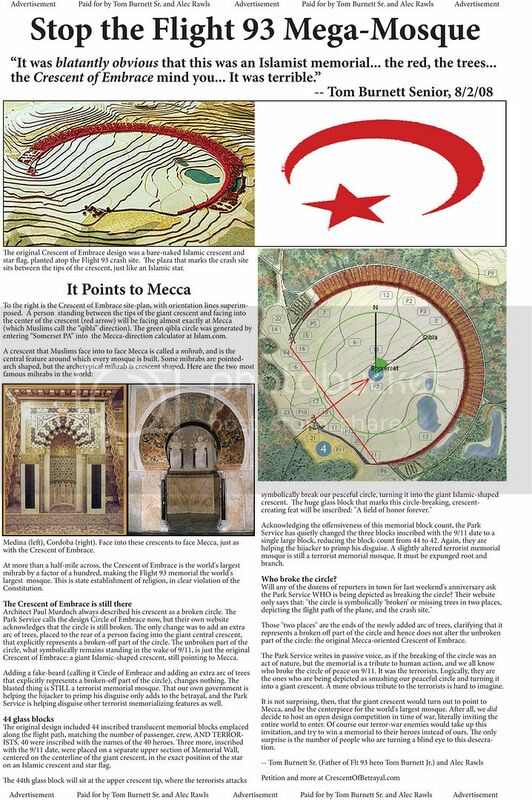 When superimposed over the crescent in the memorial design, the midpoint points over the Arctic Circle, through Europe toward Mecca. For the life of me I can't figure out how I managed to read past that paragraph (it being the one thing I was looking for). And believe me, being able to cite Kirk's fact checking would have been much more useful to me than having to claim that the Tribune Democrat was suppressing its own fact checking. But however I managed to get this wrong, I now have to fix it. Kirk Swauger and Tribune Democrat editor Chip Minemyer deserve high praise for conducting and publishing this crucial bit of fact checking, not the condemnation that I wrongly laid on them. This ad will run on the back page of the front section of the Somerset Daily American, July 23, 2007! If you have some money, this is your chance to help tackle the hijacker. Just download this ad copy and take it to your local newspaper, or send it to some Pennsylvania newspaper, for publication. At three column widths, this ad cost $550 to run in the Johnstown Tribune Democrat (medium size paper) and $250 to run in the Somerset Daily American. Both charged only a few dollars more to run the ad in their free weeklies as well. The free weeklies, with ad rates of a couple dollars a column inch, might be the best dollar value for getting the word out. There is even a chance to start a chain reaction. The ad sends people here to the website, and if they have deep pockets themselves, they can fund more ad buys. Think of it, not just as an ad buy, but as lighting a fire. If you want to help make an ad buy, but don't want to do it yourself, you can make a donation, which I will use to pay for the couple thousand dollars worth of ads I have already bought out of my own pocket, and to buy more ads. If you have big money, here is a big color ad you can run (based on the 11 x 17 poster). The ad covers about 80 column inches (depending on how wide the columns in your newspaper are). A medium-size paper charges about $50 per column inch for "general" advertising, and another $600 or so to run the ad in color. That's about $4,500. Larger papers may charge five times as much, smaller local papers about half as much. Open it up to see the impact. If we can run this baby, knockout. Similar to the poster, but does not include as much detail. Your web browser should open this file in a PDF pane with a "save" button at the upper left. There is lots of resolution so go ahead and zoom in for closer looks if you want. The image is sized to leave 1/4 inch borders when printed full size (100% scaling). It does not include a border, but should automatically center in an 8.5 x 11 sheet when printing. Like the Tower-sundial ad, this was made to be a three column ad, but can be run bigger or smaller. Anyone can download, print and post or publish this material. The flyer (8.5 x 11) can be printed on any color printer. The graphics details are pretty small, but the file has a lot of resolution (300dpi) and is perfectly readable. To print the poster (11 x 17 at 300dpi) you will probably have to take or email the file to your local Kinko's or other print shop. Kinko's charges about $1.80 for plain paper copies, $2.50 for matte cardstock copies, and $3.00 for glossy cardstock copies. All look great. I put copyright notices on some of these downloads, but hereby grant anyone permission to reproduce, transmit, transfer, publish, and even sell reproductions if they want to try, on condition that they do not alter the content without my permission, except to add announcement of a discussion or some such. 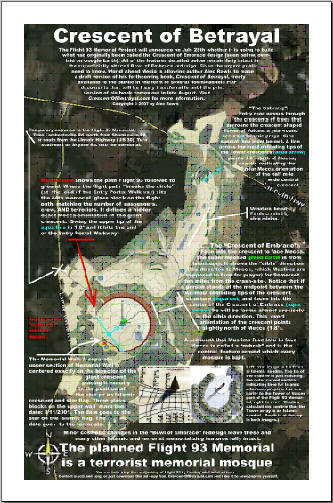 A note about the overlay of the crescent site-plan on Google Earth: To fit the site plan as best I could to Google's composite image, I rotated the site-plan .5° counter-clockwise. 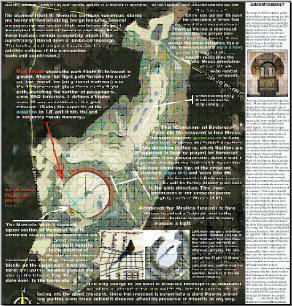 This minor discrepancy between the orientation of the site plan and the orientation of the satellite images seems to come from a discrepancy between the satellite images and the available maps of the area, rather than from any manipulation of the available maps. 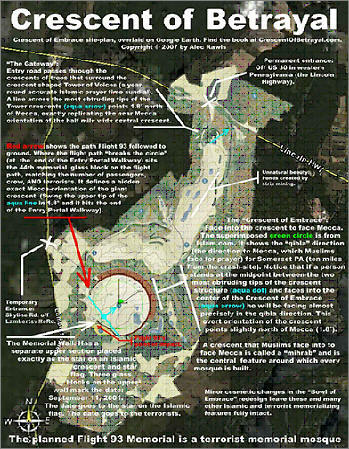 The site plan matches up perfectly with the map included in Appendix B, page 21, of the Memorial Project’s June 2007 Final General Management Plan (http://www.flight93memorialproject.org//docs/FINAL2--Appendices.pdf).